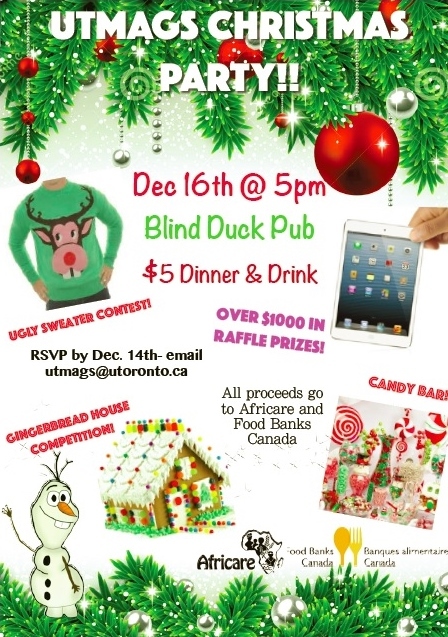 It’s time to celebrate the end of another year at the UTMAGS annual Christmas party! That is not an error on the poster – there will be over ONE THOUSAND dollars in prizes! (Did someone say “iPad”?). Raffle tickets are $2 each, $10 for 10 tickets, or $20 for 30 tickets. The donation of a non-perishable food item for Food Banks Canada will earn you an additional ticket. If your lab is interested in participating in the gingerbread house competition, email utmags@utoronto.ca to let us know, and we will follow up with details. 1 Response to UTMAGS Christmas Party!